Attached is an important essay, Anatomy of the Deep State, written by one of my closest friends Mike Lofgren (so I am biased and proud to say so!). It is posted on Bill Moyers website, and it accompanies a must see 26 minute video interview of Mike by Bill Moyers. Mr. Moyers has kindly given me permission to post Lofgren’s essay en toto. Included at the end are links to valuable commentaries by Danielle Bryon, Andrew Bacevich, Heidi Boghosian, Juan Cole, Henry Giroux, and Tim Wu. Readers of this blog should be familiar with Mike’s incisive analyses and writings, but in my opinion, he has again outdone himself. Kudos to Bill Moyers for giving visibility to a subject that should concern every American who believes in the founding principles of our nation. I urge you to watch the video interview -- "The Deep State Hiding in Plain Sight" -- before reading Mike's essay. Mike Lofgren is a former congressional staff member who served on both the House and Senate budget committees. His book about Congress, The Party is Over: How Republicans Went Crazy, Democrats Became Useless, and the Middle Class Got Shafted, appeared in paperback on August 27, 2013. Today, the Washington Post reported that its legendary defense reporter George Wilson passed away at 86. I remember him fondly, and working with people like him was one of the great blessings of my career in the Pentagon. George Wilson was one of the great reporters and a friend. I will miss him and his reporting. His call sign when phoning, at least among my group of friends in the Pentagon, was Captain Black. Captain Black always identified with the troops and low rankers at the pointy end of the spear, either on the battlefield or in the bowels of the Pentagon. And he always did it with humor, modesty, and grace ... and occasionally indignation, especially when the troops were being hosed, but never with any sense of self - importance. Captain Black did some great reporting on some really big serious issues, and he was at home as much on the battlefields as in the General's offices and on Capital Hill. But he also loved to walk the halls of Pentagon and pop in unannounced to shoot the bull and gossip -- always laughingly -- about the lunacy in the Pentagon. It was this ever present humor coupled with Captain Black's ability to skewer the high rollers that I remember the most. I particularly remember one morning in the Pentagon when I got a call from an Air National Guard one-star general, Dave Hoff, asking me for some help in getting him into the Pentagon. The civilian guards would not let him thru the gate because he did not have a Pentagon pass. That was because Secretary of Defense Casper Weinberger had just approved a stupid policy saying visiting military officers could not enter the Pentagon without a special Pentagon pass; so hundreds if not thousands of officers of all ranks visiting the Pentagon each day needed special escorts just to get them through the door. Dave was the wing commander of a Guard A-10 wing that was based in Wisconsin. His wing was part of the NATO war plan, and in this capacity, he was a full time active duty officer. He had been called to DC for one of those never-ending, boring planning conferences. He didn't want to be there. Of course he had his military ID and was in full uniform, but that did not matter; the guards said no. I got him in and he came up to the my office for a coffee before going to the meeting. Coincidentally, Capt. Black popped his head in the door, as usual for no particular reason, and after introductions, I launched Dave -- who went into a half hour tirade about how stupid Weinberger's door plugging policy was. The next day, a short hilarious story about how generals whose units were part of the NATO war plans could not get into the Pentagon appeared on the front page of the Post, and the following day the policy was rescinded. Then there was the joy Captain Black had in penning a series of front page articles that shut down Weinberger's hysterical plan to plug all leaks by hooking everyone in the huge Office of the Secretary of Defense into the flutter box, even though the lie detector test had just fingered the wrong person. The witch hunt was triggered by a story Captain Black wrote about the estimated long-term costs of the Reagan spendup made by the Joint Chiefs of Staff. On his own responsibility and at considerable risk to his job at the Post, he wrote to Weinberger to tell him he had the wrong guy and was prepared to say so under oath in court; but he would refuse to name the person who supplied him with the information. How many reporters would take such a risk to correct the record in this way? Those of you who think it is incorrect to attach “Congressional” onto the end of Military – Industrial – Congressional Complex (MICC) would be well advised to read “Lawmaker holds stock in defense contractor he champions” (by Donovan Slack, USA Today, 8 Feb 2014) to see one reason why I always include the reference to Congress. Slack describes the ethically-challenged influence peddling capers of Congressman Tom Petri (R-Wisconsin), a Harvard educated lawyer and one of longest serving and wealthiest members of Congress. Petri used his position in Congress to enhance his political career (and power) as well as his personal wealth by promoting a controversial $3 billion dollar armored truck procurement contract to Oshkosh corporation that pushed dollars, jobs, and profits into his home district as well as wealth into his own stock portfolio. Slack describes how Petri intervened to (1) fend off Oshkosh’s competitors, especially Texas based BAE corp, who had protested the contract award, accusing Oshkosh of low-balling its cost estimates and (2) how he worked to neutralize the rescue efforts by BAE’s friendly congressmen. The story is complex, and I urge you to read Slack’s report at the link above. Petri’s hijinks are old as our democracy (see this hilarious example of how the Navy’s Ship of the Line program was funded in the years after the War of 1812), but the intricacies of his maneuvers illustrate the subtle and deep-seated general nature of corruption and influence peddling now pervading our nation’s defense policy making machinery. The threads of this influence peddling network are now woven deeply, almost invisibly, throughout the entire fabric of the contemporary American political economy. Some political scientists use the metaphor Iron Triangle as a short hand for describing the structural aspects of this web of influence relationships. The attached diagram depicts the triangle’s basic features for the MICC. Note its principle idea: the two mutually-reinforcing circulations: (1) a counter-clockwise circulation of influence peddling fueling (2) a concomitant clockwise circulation of money. Moreover, as the triangle illustrates, the influence peddling and associated money flows to and from the Congressional wing of the MICC, including Petri’s operations, are but two threads in a highly evolved pattern in America’s contemporary political-economic culture. The triangle is useful in that it draws our attention to an oversight in Donovan Slack’s otherwise excellent report: Slack has no discussion of what role any links between the long-serving Congressman Petri and Oshkosh Corp. might have played in the story. He only notes a vague reference to Oshkosh by Petri’s spokesman as one of the biggest employers in Petri’s district and “we do work with them a lot.” But there is no development of what “working” with Oshkosh entails. Nor does Slack inquire into any political contributions possibly made by Oshkosh to Petri’s election campaign, or PACs, or even a possibility that some kind of quid pro quo passed between Petri and Oshkosh. At the very least, he could have written that no evidence of any influence of this kind was found. Bear in mind, the MICC is by no means unique: the same kind of iron triangle is a useful shorthand for thinking about the political economy of Big Pharma, Big Oil, the Banksters, environmental protection businesses, and other large financial or industrial networks. Our concern today, however, is the MICC. Referring back to the diagram, note how inside the triangular circulation/counter-circulation of influence and money is a reference to the revolving door. This reminds us of (1) the incestuous flow of people moving from job to job throughout the triangle; and (2) that the microscopic incentive structure of individual self-aggrandizement accompanying the revolving door is one of, if not the, major engine(s) powering the larger pattern of influence and money flows. Thirty-three years experience in the DoD convinced me that the incentive structure of the revolving door is the most poisonous influence operating within the poles of these triangles. The incentive structure produces a behavioral pattern of cynical bureaucratic gaming strategies accompanied by a mix of situational ethics that have evolved over time to lubricate and rationalize the flow of money throughout the triangle (see my pamphlet Defense Power games for some examples of these behaviors). The result has been an insensible but profound cultural evolution over time: Today, there exists an ubiquitous incentive structure in a culturally mature form, wherein it is both common knowledge and a normative moral value that people who contribute to the money flow should be rewarded, and people who pose a threat to that flow by, for example, (1) exposing problems like cost overruns, testing failures, or management incompetence, and (2) by recommending lower-cost or more efficient solutions should be punished or otherwise neutralized. Readers might think my characterization of the revolving door is too harsh. I would ask them to consider the incentive structure and moral implications implicit in Brian Bender’s blockbuster report on just the military-industrial dimension of the revolving door, “From the Pentagon to the Private Sector”. This report appeared on 26 December 2010 in the Boston Globe. Bender’s report may be the best of its kind, but it is hardly alone. Other reports illustrating the ubiquity of the revolving door can be found here and here. No doubt, President Eisenhower would have recognized most of the preceding points, including the revolving door. 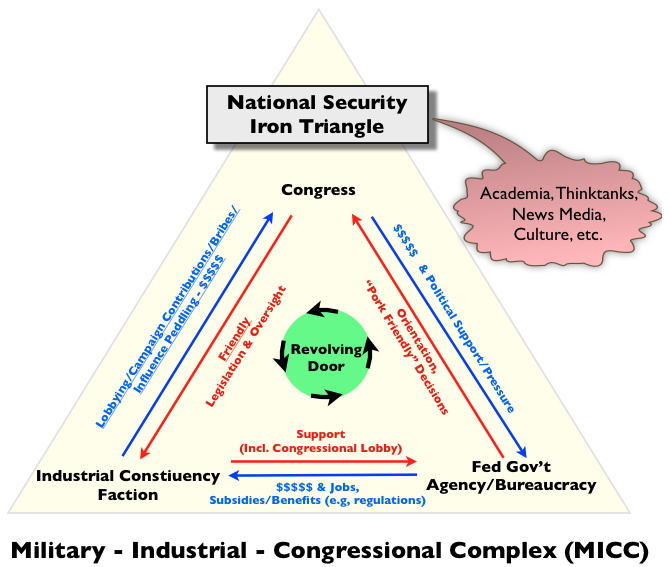 But more subtle aspects of the traditional iron triangle and military-industrial revolving door began to evolve, again almost insensibly, after 1981, when the huge flood of money was unleashed during the Reagan Administration. Perhaps the most prominent of these subtle changes has been a steady increase in the number of Congressional staffers flowing through the revolving door, moving from jobs in Congress to jobs in industry, often via political appointments in the Pentagon. Members of the Congressional staff work for individual senators and congressmen. By definition their loyalty is political loyalty to their boss’s wishes. The organizational environment in Congress is more like that of a feudal medieval court where elected officials of the lords and the staffers are the courtiers catering to the lords. Also, Congress resembles a feudal political organization in the sense that it is composed of multiple political power centers rather than the huge top-down information-processing bureaucracy of the executive branch, which organized along the strict chain-of-command lines of a military or industrial age management system. While one can argue that political power is being concentrated in leaders’ offices on Capital Hill, there is nothing in the Hill’s bureaucratic structure that remotely resembles the huge, highly centralized, rigid hierarchies of bureaucracies in the Pentagon. That is to say, there is nothing in a hill staffer’s work experience that prepares him/her for the Pentagon’s bureaucratic battlefield. Consequently former Hill staffers are particularly easy targets for the gamesters in the Pentagon and the defense industry to overload with “information” and back-to-back meetings, all the while seducing them with outward trappings of power (e.g., long titles, big offices, apparent deference, power point briefing etc.). In short, Congressional staffers who become political appointees in the Pentagon are easy meat for the seasoned civilian and military bureaucratic warriors, who are skilled in the control of information flowing into their offices. See my 2010 essay Inside the Rat’s Nest for a description of how “subordinates” set their bosses up to do their bidding. Consider, for example, the background of the new Secretary of the Air Force, Deborah Lee James. Traditionally, her qualifying “executive” experience for going through the revolving door into the Pentagon would have been with an arms manufacturer or perhaps a big commercial industrial firm. But her experience is that of a long-time Congressional staffer (and not a very prominent one at that), with a short stint in the Clinton Administration as Assist. Sec. of Defense (ASD) for Reserve Affairs. Although reserve issues should be important in the grand scheme of things, that ASD position is one of the least powerful and least effectual ASD positions in the entire Office of the Secretary of Defense in the Pentagon. After leaving the Pentagon, Ms. James rotated through the revolving door into SAIC, a well known Beltway “consulting” firm, and a notorious revolving-door way station for apparachiks leaving government, who want to (1) cash in on their connections to do business with the government and (2) pad their resumes for a future job in government. A biting summary of Ms. James background can be found in Debbie Does USAF. To be sure this is a snotty portrayal by a former Bush II official who seems to have an ax to grind. But can anyone possibly believe that a person with James’ kind of background has built up the requisite technical knowledge, management savvy, and decision-making expertise needed, for example, to (1) rein in huge, out of control programs like the F-35, or (2) withstand the bureaucratic and political pressure to start a new high cost stealth bomber program (which, by the way, requires starting a new cold war with China for justification). And while Ms. James is coping with the types of specific management problems mentioned above, she must also cope with an Air Force budget plan that is more out of whack than at any time since I began studying this plans/reality mismatch problem in the early 1970s. Nothing in her background has prepared her for the bureaucratic battles over the crises between readiness and modernization, not to mention the need to solve the moral and leadership problems that are now sweeping over the Air Force . Nothing in her background has prepared her for the even more complex bureaucratic battles with Army and Navy in an increasingly stressful budget war over what service gets hosed by the long-term financial pressures posed by the budget sequester. Or consider the new nominee for the Deputy Secretary of Defense — the more capable Robert Work. Work is a well educated, retired Marine Colonel with post-retirement stints as an undersecretary of the Navy during the first Obama Administration and in think tanks. But those think tanks, especially the Center for Strategic and Budgetary Assessments (CSBA), have a history of advocating certain types of high-cost, high-tech defense technologies, especially robotics and stealth technologies (including particularly a new stealth bomber for the Air Force). Moreover, at least one of these think tanks — CSBA — has a long history of receiving money from the Pentagon’s Office of Net Assessment to produce studies advocating the need for these stealth and robotic technologies together with the concomitant strategies aimed at “containing” China. Whereas Ms. James epitomizes the congressional hack rolling through the revolving door, Work’s passage thru the revolving door illustrates the growing influence of more obscure outfits — think tanks with agendas and obscure links between industry and government — that lie outside the traditional poles of the iron triangle. Advocacy outfits, like CSBA, that pose as dispassionate, independent, quasi-scholarly sources of bipartisan information, may have less visible connections to the players in the Iron Triangles, but their funding patterns and advocacy agendas show they are deeply connected to the larger MICC agendas. Bear in mind, I have only scratched the surface of the revolving door problem and the big cozy family of courtiers in the Hall of Mirrors that is Versailles on the Potomac. Anyone who thinks the Obama Administration is going to rein in the MICC now that Afghanistan is winding down, need only compare the interests of the Iron Triangle to its panoply of political appointees to see why the big green spending machine is poised to pass on the costs of the budget sequester onto social programs and perhaps start a new cold war with China to justify the extravagance. It should come as no surprise, therefore, that the Obama Administration is now signalling that it will cave in to this network’s pressures and exempt the Pentagon budget from the constraints of the budget sequester and begin growing the defense budget in FY 2016 and beyond. Welcome to the best government money can buy. The National Commission on the Structure of the Air Force just sent its final report to President Obama and Armed Services Committees in both the houses of Congress on January 30, 2014. This glitzy report is over 122 pages long, with its main body being 45 pages, and almost 80 pages of appendices. Obviously, the report cost hundreds of thousands if not millions of dollars to produce. Did the American taxpayer get anything of value for this expenditure? Will the information in this report serve any constructive purpose other than bloating the resumes of the Commission’s members? The short answers are NO and NO. Like most blue ribbon panel reports, this one is destined for the dustbin of history. It ducks even a basic acknowledgement of the most fundamental force structure issues facing the Air Force. The only effect is to lull the reader to sleep with deadening verbiage. It that sense, this report is a really pathetic, if all too typical, example of why our government cannot solve its most basic problems. But the report does have one redeeming value: Its egregious omissions demonstrate the extent to which the collective mind of the American governing elite is disconnected from reality and is talking to itself. A very simple exercise proves this point: I ask you to take a few minutes to peruse this report; to repeat, it can be downloaded from this link. Now, for a little background on the problems underpinning the subject this report claims it is addressing: Fundamentally, the Air Force’s structural problems are rooted in its long procurement history of buying ever more technically complex equipment, with each new generation of equipment costing substantially more to buy and operate than its predecessor. This has caused an economic asymmetry wherein rising unit costs that always grow faster than budgets grow, even when budgets increase very rapidly, as they did in the 1980s and after 1997. The consequences of the relationship have been well understood for a long time: Weapons increase in complexity, force structure shrinks in size, weapons already in the inventory become older on average, and there is continual pressure to reduce readiness, because increasing complexity reinforces the aging to magnify operating costs further. The long-established Pentagon’s Power Games accelerate this evolution when budgets increase — the little shop of horrors known as the F-35 Joint Strike Fighter being a recent case in point. First, as forces shrink in size, supporting physical infrastructure also shrinks (e.g., via base closures or depot shutdowns); but infrastructure is protected by local political pressures, so it always shrinks more slowly that force structure shrinks. Consequently, in the case of the Air Force, the bed down of airplanes on bases has become more diluted over time and its depot capacities become more excessive. These differential rates of shrinkage create cost-growth pressures and institutional rigidities that magnify the evolutionary pattern (DS analyzes this evolution explicitly on pages 49-50). Second, as forces shrink, organizational infrastructure (i.e., the number of operational units, command structures, headquarters, support services, etc) shrinks at a slower rate. Command structures become top heavy with a bloated rank structure. In the case of the Air Force, squadrons have fewer aircraft, wings have fewer aircraft, numbered Air Forces have fewer aircraft. In short, the increasing organization bloat produces requirements for excessive numbers of Lieutenant Colonels, Colonels, and especially Generals. The excessive rank overhead, coupled to an “up or out” promotion system, has all sorts of pathological results — e.g., it increases the predilection for micromanagement, over-centralization, bloated staffs, busywork, etc. These evolutions translate into increased costs in peacetime. Even worse, they increase organization rigidity to slow down decision cycles when the military goes to war (DS, especially pages 34-36). If you doubt this, just look at the tooth-to tail-ratio and bloated command structures in Afghanistan. Published: Washington Post Outlook, April 16, 1989, Republished shortly thereafter in Air Force Times. Author’s note: This the officially cleared version and does not include minor copy editing changes by the editors of Washington Post. Between 1980 and 1989, defense spending grew by 40% in inflation adjusted dollars. The increase was not, however, distributed evenly throughout the budget; procurement and R&D spending soared by 67%, while spending for current operations (personnel, operations, and maintenance) increased by only 23%. As I explained in an earlier article (October 31, 1988), we “front loaded” our budgets with politically engineered modernization programs in the mistaken belief that, by spreading the money around to the important congressional districts, we could buy votes for ever larger defense budgets. Despite repeated warnings, Congress signed up uncritically to one front-loaded budget after another in the 1980s. The money flowed to contractors and subcontractors located throughout the fifty states, and defense jobs increased by 63%. Now we are poised to reap the consequences: even if future budgets are frozen at the current level, a huge bow wave of unaffordable procurement commitments and a stern wave of deferred readiness obligations will wash over the Pentagon and Congress in the early 1990s. If we do not change the way we do business, production rates will decline (but few programs will be cancelled), readiness for combat will plummet, equipment will get older, and forces will shrink. Some — perhaps many — defense workers will lose their jobs. What can be done to moderate the damage caused by the reckless politicizing of defense decisions? Is it possible to devise a fiscally responsible retrenchment plan that lays out an effective defense program without succumbing to the usual expedients of robbing readiness and shrinking the size of our forces to preserve the politically engineered money flows? It is possible–but only if our leaders have the courage to step up to some really tough choices. The fun is over, and as we say in the Pentagon, it is time to slaughter some sacred cows. One option for reducing budget requirements in the 1990s is to move a larger portion of our forces into the reserves. This appears to be most attractive in the case of the Air Force; but even in the case of the Air Force, it is not politically painless. To be effective, the reserve option must be part of a larger plan–one that forms a smaller number of larger units and closes excess bases. Such changes could generate enormous savings; readiness and sustainability could actually be increased; and further force shrinkage might be averted. Lets take a closer look at why it is possible to build a stronger Air Force for less money. Simply shrinking the size of the active force and increasing the reserve proportion does not automatically generate savings over the long term. Between 1956 and 1990, the active Air Force will have shrunk from about 23000 to 6900 airplanes–a decline of 70%. During the same period the reserves will have dropped from about 3000 to 2200 airplanes, but its share of the total force will have doubled from 12% to 25%. The drop in total operations is comparable (from 9 to 3.3 million flying hours). These impressive reductions did not generate any savings; on the contrary, after taking out the effects of inflation and introduction of ballistic missiles, we will spend 6% more for operations and maintenance in 1990 than in 1956 ($23.3 versus $21.9 billion in constant FY 89 dollars). First, the evolution of ever more complex technologies increased operating costs. Fighter aircraft are a case in point: taking out the effects of inflation, our top tactical fighter in the mid-1950s, the F-100, cost about $1470 per hour to fly, while today’s top fighter, the F-15C costs over three times as much to fly–about $4660 per hour. High-technology engines and electronics, in particular, require more costly maintenance skills, increase the need for capital intensive diagnostics and repair equipment, shift repairs away from flight lines toward distant depots, and generate the need for more costly logistics technologies to manage the proliferating assortment of high value spare parts. In addition to driving up direct and indirect costs, these changes created economies of scale that favor the concentration of airplanes at as few locations as possible. In the continental U.S. and Alaska, after removing the bases recommended for deactivation by the base closing commission, there are at least 60 bases, with 300 million square feet of concrete, available to the active force for the “bed-down” of its combat-coded, replacement training, and sundry support aircraft. In 1990, however, the force structure assigned to these bases will require only 150 million square feet of parking space–yielding an average base load factor of 50%. (This calculation is based on official planning factors.) Moreover, the distribution is very uneven, eight bases have load factors in excess of 100% while 14 others, for example McClelland and Bergstrom (with load factors of 7% and 12%), have load factors of 20% or less. * In 1990, the 31 active KC-135 tanker squadrons have between 10 and 19 aircraft, the average being about 14. The historical norm for large airplanes is 18 planes per squadron. * Between 1986 and 1990, the active force of C-141 transports will have decreased by 16 aircraft, but the number of squadrons in the active force will have increased from 13 to 16. In three years, the average size of a C-141 squadron will have shrunk from 18 to 13.6 airplanes–a 24% decline. Squadron sizes now range from 12 to 17 aircraft. Taken together, low base load factors and understrength and irregularly structured squadrons mean we are using people and facilities inefficiently. We could reduce costs without shrinking the force by assigning more aircraft to some bases, by forming larger units, and by closing other bases. If, for example, we decided to increase the average base load factor from 50% to a modest 60%, we could eliminate 50 million square feet of concrete. This equates to closing somewhere between five and nineteen more bases, depending on whether we close large or small bases. So, even in the absence of an active-to-reserve swap, there is a real opportunity to reduce overhead by consolidating the active force. Now suppose we also take some airplanes off the 60 active bases by transferring them to reserve units, most of which are located at municipal airports around the country. If we keep the 60% load-factor goal and the larger active units, we could close even more bases, and multiply the savings further. Lets examine the reserve side of the restructuring opportunity. Reserve units are also too small; 70% of the tactical (fighter/attack, recce) and 100% of the intercepter squadrons have 18 instead of 24 airplanes; 100% of the tactical airlift squadrons are assigned only eight C-130s; and the strategic tanker and airlift squadrons are assigned eight or ten KC-135s or C-141s. With a few exceptions, these units can be easily and cheaply expanded. Most fighter and intercepter units already have facilities that are capable of supporting 24 aircraft, and the airlift and tanker squadrons have facilities designed to support 12 aircraft. Moreover, the current recruiting situation is excellent; somewhere between 500 and 800 pilots are now trying to enter the reserves. So, a large number of active airplanes can be transferred to the reserves without forming new reserve units. Now, bringing the different strands of the analysis together, the general idea is as follows: Consolidate the active force into a smaller number of larger units; transfer planes from the active force to the reserves to bring reserve units up to strength; where transfers are not feasible, consolidate the reserves into a smaller number of larger units by deactivating some reserve units and transferring their airplanes to other units; close enough bases to modestly increase the average base load factor for the active force from 50% to 60% or 65%. * Transfer 240 tactical fighters to the reserves (deactivate 10 active squadrons) to bring all the reserve units up to full strength. * Consolidate the reserve C-130s into eighteen 12-plane squadrons (deactivate 8 reserve squadrons). An active-to-reserve transfer is probably not appropriate since about 60% of the tactical airlift force is already in the reserves. * Transfer 20 C-141s to the reserves (forming one new 18 aircraft squadron and increasing the size of another reserve squadron to 10 aircraft); consolidate the active force into eleven 18- aircraft squadrons (deactivate 5 active squadrons). * Transfer 14 KC-135s to the reserves and use aircraft to increase 7 reserve squadrons from 8 to 10 aircraft; consolidate active force into twenty-four 18-aircraft squadrons (deactivate 7 active squadrons). * Consolidate the reserve interceptor force into nine 24-aircraft squadrons (deactivate 3 squadrons). * Use some of the savings to correct the growing shortages in the war reserve stockpile of spare parts and munitions. Result: the number of combat-coded airplanes stays the same, the total force is more combat ready because it is better supplied, 274 more airplanes (a 4% reduction in the active force) are in the reserves, and the reduction of at least 50 million square feet of concrete (closure of 5 to 19 bases) and the deactivation of 33 squadrons (22 active, 11 reserve) results in a leaner infrastructure that reduces manpower and budget requirements. Rotation Base. A transfer of 240 fighters to the reserves will require a reduction in forward-based tactical forces in Europe and Asia because the stateside force will be too small to support reasonable personnel rotation policy. There is merit to this argument, but there are ways around it. Assuming we need to keep the same rotation policy (40-45% of our forces forward), we would have to reduce the forward forces by four squadrons (96 airplanes). While this reduction could have important consequences affecting alliance politics, the strategic consequences could be negated by dual-basing (keeping the overseas bases fully supplied and ready to receive aircraft while basing the aircraft in the U.S.) four more active units in the states. Our strategic warning capabilities are adequate to permit the timely deployment of these forces in periods of increasing tension. Moreover, the dual-basing policy could be combined with a burden-sharing plan in which our allies pay for the upkeep of the forward bases. Rated supplement. The Air Force currently has about 22000 pilots and about 6900 airplanes (some of which require two pilots). The rated supplement is composed of those pilots assigned to non-flying duties. It has been argued that a transfer of a total of 274 aircraft to the reserves (a 4% reduction in active aircraft) will make the flying inventory too small to support the manpower policies governing the assignment of pilots to non-flying jobs. All that is needed to get around this bureaucratic logjam is a revival of the “can-do” spirit. Non-mobilized contingencies. Some believe that a transfer of this magnitude would inhibit our ability to respond to undeclared wars such as the Grenada invasion. This argument relates mainly to tactical fighters, and it needs to be put into perspective. We have about 1750 fighter/attack aircraft in the active force; a transfer of 240 to the reserves would leave about 1500 in the active force. Surely 1500 airplanes is a large enough asset base to support such contingencies. Reserve recruitment. Some believe that a transfer 4% of the active force to the reserves will result in a long-term recruiting problem for the reserves–that by reducing the demand for new pilots in the active force, you reduce the number of pilots who eventually quit the active force, and therefore fewer pilots will be available to join the reserves in the 1990s. This argument turns the current situation on its head; pilots are waiting in line to join the reserves, and the active force has a mushrooming retention problem. If a reserve recruiting problem eventually emerges, we could recruit pilots directly into the reserves after they graduate from college, as is now done on a selective basis in the National Guard. But this is in the distant, unpredictable future. There is one counter-argument that will not be heard, namely that the reserves are not as effective as the active force. One of the best kept secrets in the DoD is the story of the Air Force’s reserves, particularly the Air National Guard. The reserves are a superb fighting force; they win more than their fair share of tactical competitions; they are manned by highly experienced dedicated personnel, and given a decision to mobilize, they can deploy as rapidly as the active force; and because they operate on a regimental system, reserve units have good personnel retention, they have enduring ties to local communities, and they have high unit cohesion and esprit de corps. If the shift to the reserves were combined with increased purchases of spare parts and munitions (made possible by the savings from the consolidation described above) a more combat ready, lower cost Air Force is possible. Of course there in nothing in the Commission’s report that even hints at these kinds of possibilities. One final point: We all know the DoD budget is poised to slow its rate of growth and possibly even decline in the short term. News reports indicate the Air Force’s force structure is poised to shrink yet again, and notwithstanding the huge increases of recent years, the AF has its worst aircraft aging problem in its entire history. These conditions also apply the force structures of the Navy and Army. 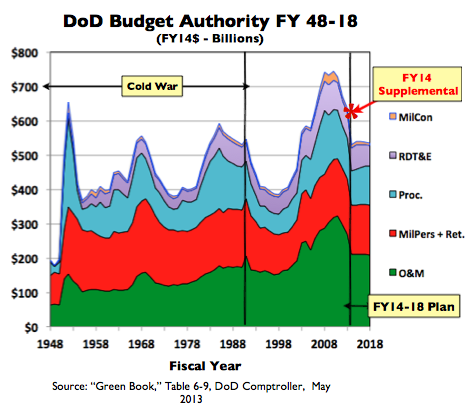 Yet, as this chart shows, the Pentagon’s Operations and Maintenance Budget (O&M - the green shaded wedge) has exploded since 1997, even if one removes the effects of inflation using DoD’s cooked deflators. Moreover, that O&M budget is poised to remain higher throughout the Pentagon’s peacetime planning horizon out to 2018 than at any time between 1948 and 2000. Note, this peacetime O&M projection is substantially higher than the O&M budget at the peak of the Vietnam war, yet it will be supporting force structures between 25% and 40% as large as those of the Vietnam War, and it is predicated on low peacetime operating tempos. Also bear in mind, the out year projection is much higher that that implied by the dreaded sequester. So, the Commission’s report appeared at a propitious time. Apparently, the Commissions’s goal was to determine what changes to the force structure and mix of active and reserve forces can help the Air Force cope with future budget constraints. This necessarily implies dealing with the monstrous O&M problem depicted above. * Is there any new information in the Commission’s report that will help decision makers reorganize the force structure of the Air Force in a way that helps to extract the Air Force from its ever more costly death spiral, especially when one considers the implications of the the projections in the chart or the budget sequester? * Or will the Commission’s obvious analytical omissions, merely work to set the stage for a horrendous readiness debacle in the near term, accompanied by the usual cries of a “hollow military,” to be followed by yet another burst of budget growth to bail out the DoD and the Military – Industrial – Congressional Complex? * Finally, can American taxpayers ever get his/her money’s worth out of government, if their government continues to waste money on blue-ribbon commissions manned by apprarachiks who produce glitzy reports that paper over real, obvious, and growing problems? To ask such questions is to answer them; and that demonstrable incompetence, dear reader, is why your Social Security and Medicare are poised to be sacrificed on the altar of the Military – Industrial – Congressional Complex in the name of fiscal prudence.